"Our club is very grateful for the generosity of the New England Revolution Academy. With this donation, we’ll be able to provide greater opportunities to more players. We look forward to continuing the development of top players in our region with our strong alliance with the Revolution Academy. Isaac’s determination and talent allows him the opportunity to serve as a role model for Revolution Academy and Bayside FC players as he embarks on his professional career." FOXBOROUGH, Mass. – Committed to affording the region’s players free access to elite coaching and development experiences, the New England Revolution Academy is increasing its investment in youth development with the launch of two new programs – a new initiative to bring free soccer training to underserved players in Boston and a new scholarship program to reward alliance clubs for their role in developing first team players. In addition to the Revolution's fully-funded academy, these programs will give more opportunities to young players throughout the region and grow the club’s reach in identifying and developing top talent. To give underserved players greater access to the game, the Revolution Academy will begin hosting talent development programs (Regional Development Schools) in communities surrounding Boston. The free programs will give young players an opportunity to showcase their talent for the Revolution Academy staff leading the sessions and provide young talent a pathway to join the Academy. Starting in fall 2018, the cost-free programs will help mitigate barriers to elite level training, such as transportation, program fees, travel-related expenses, and equipment. Recognizing the important role alliance clubs play in nurturing young talent, the Revolution Academy is investing back in the soccer communities that develop Homegrown Players for the Revolution's first team and has established a scholarship program for Academy Alliance Partners. The scholarship will be awarded when a partner club’s former player signs a first team contract with the Revolution and is intended to recognize the role the alliance clubs provide in developing players who join the New England Revolution Academy. The Revolution Academy formed its U-12 Academy Alliance partnership with Bayside FC, NEFC, and Valeo FC in April, 2016 to expand the Revolution Academy's reach in discovering and developing talent in the New England region. Bayside FC of East Providence, R.I. will be the first recipient of a scholarship donation. 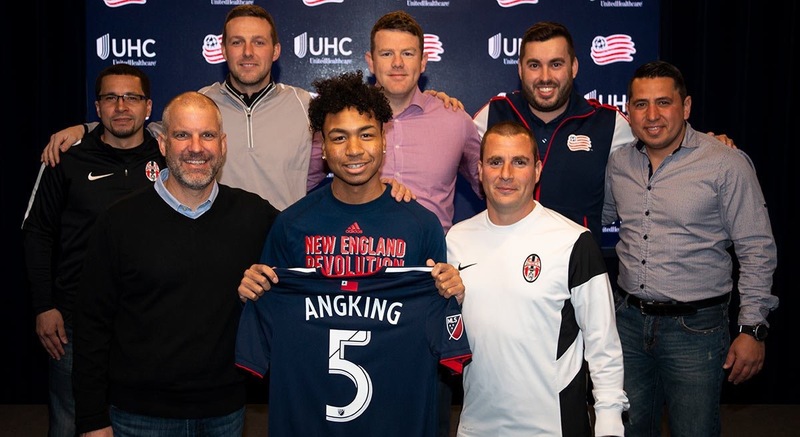 The club will be awarded $10,000 in recognition of their development of New England's fourth Homegrown Player signing, Isaac Angking. Angking was with Bayside FC from 2009 – 13 before joining the Revolution Academy for five years. He signed a professional contract with the New England Revolution first team in January, 2018. "Our club is very grateful for the generosity of the New England Revolution Academy. With this donation, we’ll be able to provide greater opportunities to more players,” Bayside FC president John Mark Andrade said. “We look forward to continuing the development of top players in our region with our strong alliance with the Revolution Academy. Isaac’s determination and talent allows him the opportunity to serve as a role model for Revolution Academy and Bayside FC players as he embarks on his professional career."